The APT bursary was fundamental in opening up my career path. I gained my Postgraduate Diploma in the ‘Conservation of Historic Objects’ from DeMontfort University in 2001 and my MA in 2003. Working as a stained glass conservator for Lincoln Cathedral in 2011 I became an ICON Accredited Conservator Restorer (ACR). Having been in the profession for well over 25 years now I have been involved in many conservation projects working on glass dating from 13th to the 20th Century. As head of the department I take a more administrative role nowadays but still have time to go on site or do practical work in the studio. 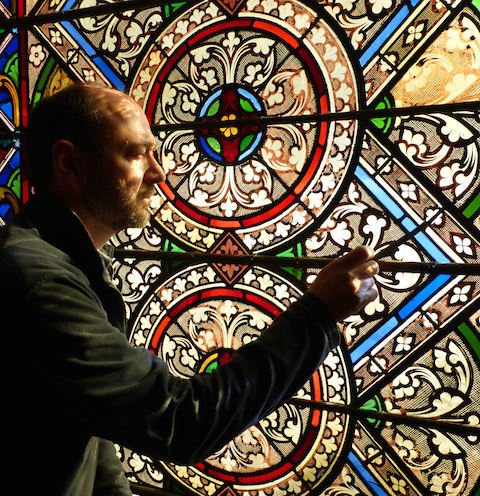 With both the hands-on and academic knowledge I am the stained glass conservation advisor to both the Lincoln and the Nottingham Diocesan Advisory Committee and to the Church Building Council, London. I am involved in training and teaching and have lectured at the University of York, and at Savannah Technical College, Georgia, USA. With still so much to discover and learn I am currently studying for a PhD at Lincoln University.